Lacing Threading Wooden Cotton Reels are twenty colourful wooden cotton reels and two lovely long cotton laces all packed in a wooden box. Each cotton reel has a hole in the centre, just like the real thing, and can be threaded onto the two 60cm long laces. These reels can also be stacked one on top of the other and sorted into colours. 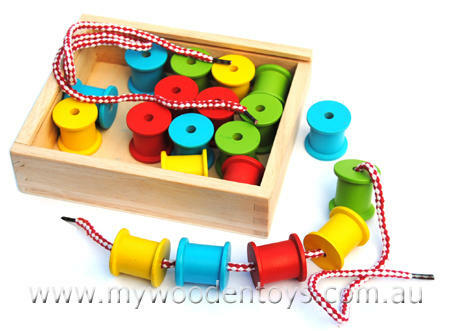 A great traditional toy and wonderful for those fine motor skills. All the reels and laces pack away into the sliding top box after play. Size: Box is 19cm x 16cm, Reels are 3.5cm high, Laces 2 x 60cm long. We like this because: "Simple traditional toy "